On Thursday night our marathon of State Relay Championships began with the Non-Public A and Group 1 competitions. The championships were entertaining all night and the distance medley relays especially did not disappoint. The Non-Public A boys race was a battle between Camden Catholic and Christian Brothers Academy with multiple lead changes. 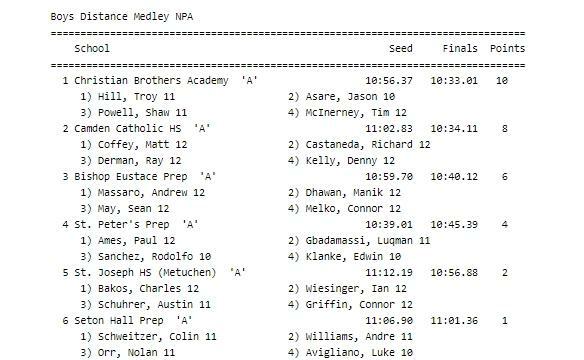 In the end Tim McInerney's final leg of 4:23 was took much to handle and CBA earned the win running a state leading and US#5 time of 10:33.01. Camden Catholic was second with a NJ#2 US#6 10:34.11 performance. #NJRelays the Boys NPA saw CBA run 10:33 US#5 after multiple lead changes and a great fight from Camden Catholic 2nd at 10:34 US#6. McInerney was too much to handle on that anchor, a cool 4:23. This will be one to watch when the race video goes up.